Norman’s lawyers took aim at the government’s decision to label dozens of documents, including several memos to Prime Minister Justin Trudeau from the country’s top bureaucrat, Michael Wernick, as solicitor-client privilege. In a document submitted to the court on Tuesday, Norman’s lawyers said the chart represented “the linchpin to the Crown’s case and undermining it is central” to their ability prove the suspended military officer’s innocence. The government wants to keep the memos, chart and numerous other documents secret, with lawyers from the Department of Justice arguing during a pre-trial hearing that they represent legal advice and should thus be protected. Norman’s lawyers accused the government of applying the label too broadly, pointing out neither Trudeau nor Privy Council clerk Michael Wernick are lawyers, and asked the court to determine whether the documents were truly privileged. Even if the documents were properly labelled, Norman’s legal team added, the court can — and should — lift the privilege if their client’s innocence is at stake. The back and forth represented the latest twist in Norman’s high-profile legal drama, which has dragged on for more than two years and is currently scheduled to culminate in a full trial starting in August and running through the election. Justice Heather Perkins-McVey is responsible for determining whether the privilege has been properly applied and, if so, whether the documents should nonetheless be disclosed to ensure Norman gets a fair trial. 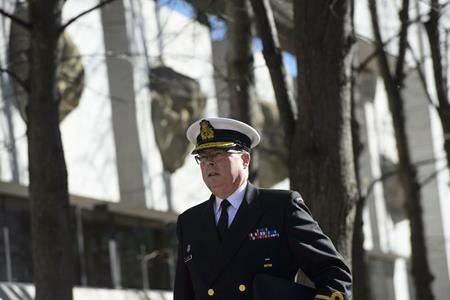 Norman served as the military’s second-in-command before being suspended and charged with breach of trust for allegedly leaking government secrets to influence cabinet’s decision-making on a $700-million shipbuilding contract. He has denied any wrongdoing. His legal team has alleged that the case against him is politically motivated and is trying to get access to the requested documents to officially make that case in an effort to get the charge tossed out. Norman’s lawyers scored a partial victory on Tuesday when Justice Department lawyer Robert MacKinnon revealed that the government had accidentally disclosed some records labelled legal advice but would not fight to keep them secret. They also grilled Patrick Hill, director of operations at the Privy Council Office, the department that supports the prime minister, on why solicitor-client privilege had been claimed for a variety of documents related to Norman’s case. Asked about one of the memos sent to Trudeau from Wernick, Hill testified the document was in fact authored by lawyers within the Privy Council Office and sent to the prime minister through the clerk — as is common practice. The two also sparred over what constituted solicitor-client privilege, particularly as Henein questioned Hill about an August 2017 email chain from PCO lawyers updating the department’s communications section about the case. At one point, Henein asked whether former attorney general Jody Wilson-Raybould would have been copied on any of the memos or legal advice provided to the prime minister about Norman’s case. Hill, who will return to the witness box on Wednesday, said he was unaware of Wilson-Raybould being copied on any of the documents.